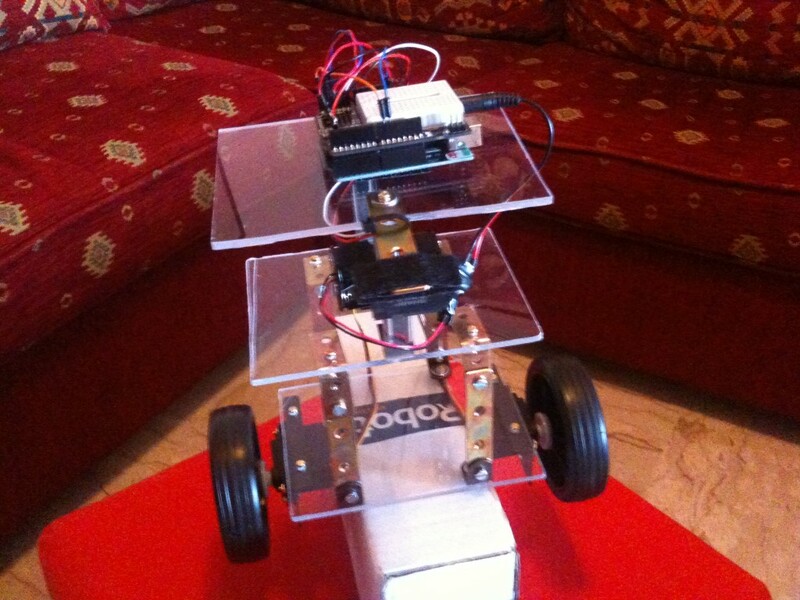 The self-balancing robot building is today an activity that every robot builder can perform with Arduino. Searching in Google for self-balancing robot you can find tons of realizations, with tons of different sensors and control systems. 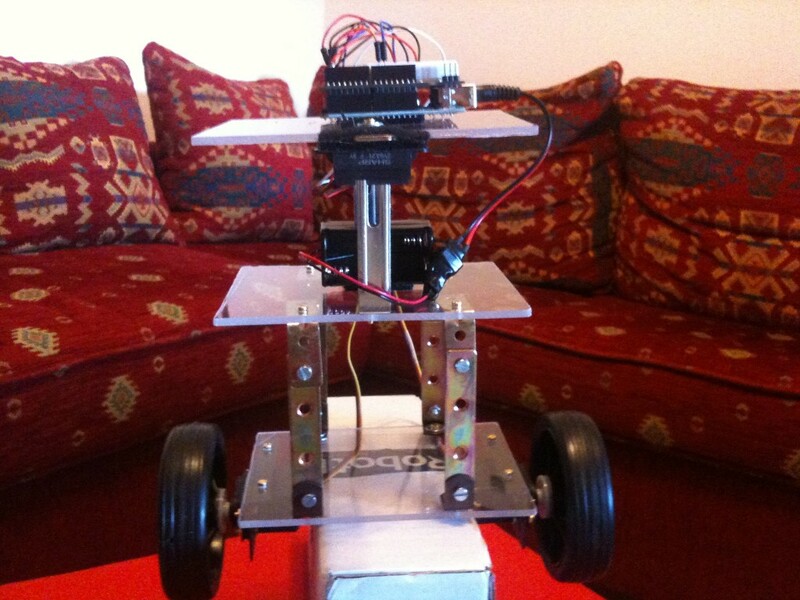 So to build a self balancing robot is a standard task for the robot builder, like a simple home rover. 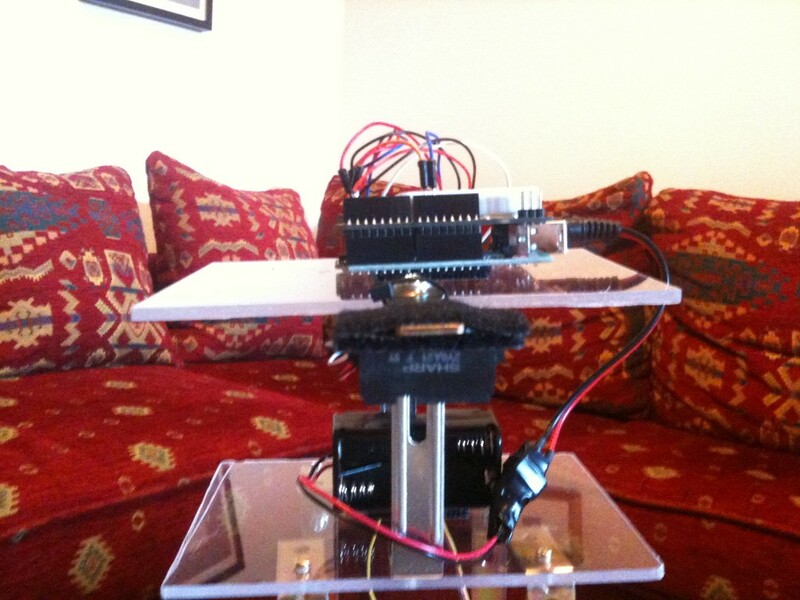 So I tried to build a self-balancing robot using only one sensor: a Sharp IR distance sensor e nothing else. No gyro, no accelerometer, no other sensors. All is self-built, in the DIY pure spirit. 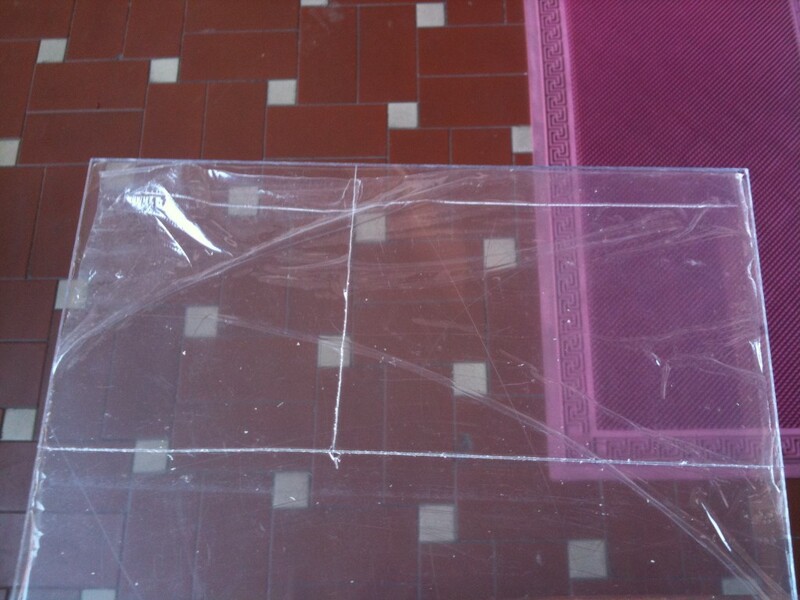 We are under 100 euros, a good results concerning the cost. 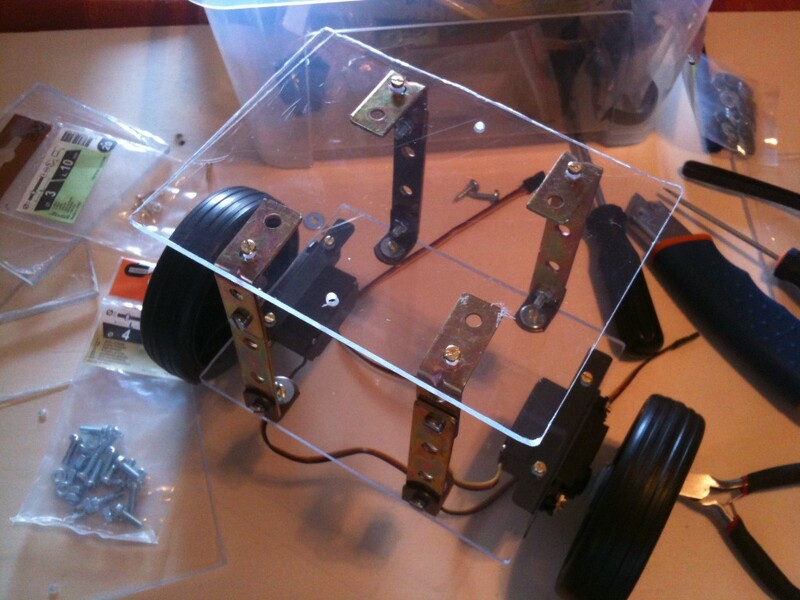 This is the phase of the chassis building, transparent and in plexiglass. 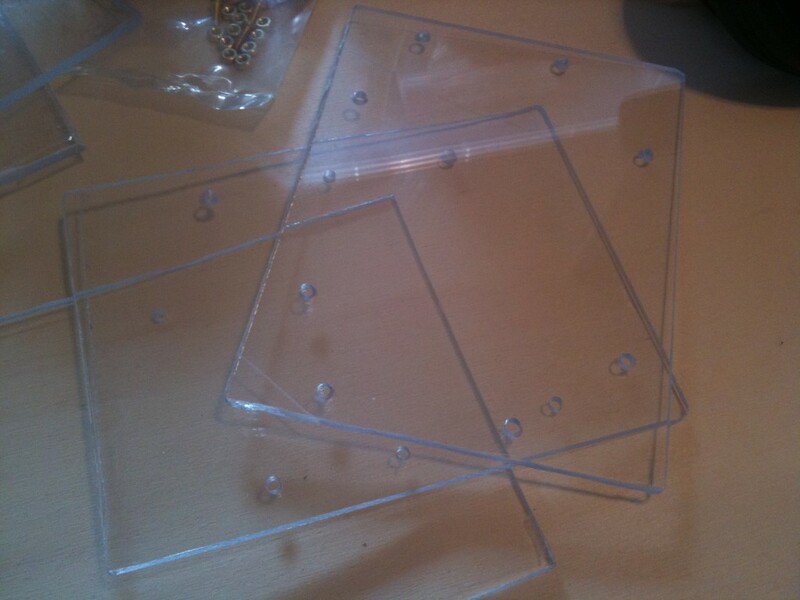 In particular, the chassis cuts has been made with a simple cutter, after the holes has been made with a drill. Here is the robottino completed and mounted. You can see the IR Sharp sensor, upon a little arm outside the chassis. I built a robot with 3 floors, in order to study the distribution of the weight on the stability. Actually, I didn’t make important tests on it. On the Arduino 2009, I put a shield with the breadboard and on the breadboard an accelerometer. Now the accelerometer is not wired, but in the future, perhaps, I will use it. Some construction detail about the robot. The control algoritm uses a PI control, a PID where the derivative term is equal to zero. The signal coming from the IR sensor is filtered in a very simple mode. 10 values are read, then they are sorted and cancelled the ‘tails’, i.e. the 2 value littlest and 2 values biggest and with the 6 values remaining I made the average. So there aren’t kalman filter or similar. The IR signal is enough clean to do a simple average. The sensor have a 10-80 cm range and it has a trasfer function voltage-distance similar to an hyperbole in the working range, so I tried to put it in the point of maximum sensibility, in order to obtain the maximum voltage variation compared with the distance. At the beginning I tried to use only the P term of the PID control (only Kp different to zero). I passed many hours searching to find the balance, but I never had a success, so I confirmed the theory that says that with the only proportional term you can obtain only some oscillations.Introducing the integral term (Ki different to zero) I obtained an immediate benefice and with some test I found the balance value. I made some attempts to introduce a disturbance (with a push) to see the rejection of the disturbance. As you can see the situation could be better, because after a few seconds the robot is in resonance, but at the end it can hold in balance. This is due to the lack of the derivative term (Kd) wich serves to limit the oscillations. Some considerations: the robottino is extremely sensitive to the change of control coefficients. In fact, changing only 10% of the coefficients Ki and Kp, the robot can’t hold in balance. I can say that I had fortune to find a couple of correct parameters. Putting the weight of the batteries from one floor to another, I couldn’t find the right parameters for the balance. So finding the right parameters is a patience work. I think that using only one sensor is a ‘limit’ situation in order to get the balance. So my advise is use two or more sensors!